Tensile Strength—In tensile testing, the ratio of maximum load to original cross-sectional area. Also called ultimate strength. Yield Strength—The stress at which a material exhibits a specified deviation from proportionality of stress and strain. An offset of .2% is used for many metals. Yield Point—The first stress in a material usually less than the maximum attainable stress, at which an increase in strain occurs without an increase in stress. Only certain metals exhibit a yield point. If there is a decrease in stress after yielding, a distinction may be made between upper and lower yield points. Elongation—In tensile testing, the increase in the gage length, measured after fracture of the specimen within the gage length, usually expressed as a percentage of the original gage length. Reduction of Area—(1) Commonly, the difference, expressed as a percentage of original area, between the original cross-sectional area of a tensile test specimen and the minimum cross-sectional area measured after complete separation. (2) The difference, expressed as a percentage of original area, between original cross-sectional area and that after straining the specimen. Hardness—Resistance of metal to plastic deformation usually by indentation. However, the term may also refer to stiffness or temper, or to resistance to scratching, abrasion or cutting. Indentation hardness may be measured by various hardness tests, such as Brine/I, Rockwell and Vickers. Brinell Hardness Test—A test for determining the hardness of a material by forcing a hard steel or carbide ball of specified diameter into it under a specific load. The result is expressed as the Brinell hardness number, which is the value obtained by dividing the applied load in kilograms by the surface area of the resulting impression in square millimeters. Rockwell Hardness Test—A test for determining the hardness of a material based upon the depth of penetration of a specified penetrator into the specimen under certain arbitrarily fixed conditions of test. Impact Test—A test to determine the behavior of materials when subjected to high rates of loading, usually in bending, tension or torsion. The quantity measured is the energy absorbed in breaking the specimen by a single blow, as in the Charpy or lzod tests. Charpy Test—A pendulum-type single-blow impact test in which the specimen, usually notched, is supported at both ends as a simple beam and broken by a falling pendulum. The energy absorbed, as determined by the subsequent rise of the pendulum, is a measure of impact strength or notch toughness. Izod Test—A pendulum type of single-blow Impact test In which the specimen, usually notched, is fixed at one end and broken by a falling pendulum. The energy absorbed, as measured by the subsequent rise of the pendulum, is a measure of impact strength or notch toughness. *With the addition of .15/.35 per cent Lead to these alloys, mechanical properties are not appreciably affected. Machinability, however, is improved approximately 25 per cent. “Summit Steel’s pricing is pretty reasonable,” [one] fabrication supervisor adds. 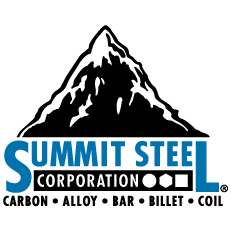 “Right now, customer service stands out as we look at other [products] we need to make in the future.” He notes that because of the successful coupling in the past, this North American company is likely to work with Summit Steel on future endeavors. “We have a contact person who looks after us—he emails me with updates”.